NO WAITING, SAVE MONEY AND TIME, IMMEDIATE DELIVERY!! Riviera’s stylish and sophisticated 6000 Sport Yacht is the ultimate on-water entertainer. 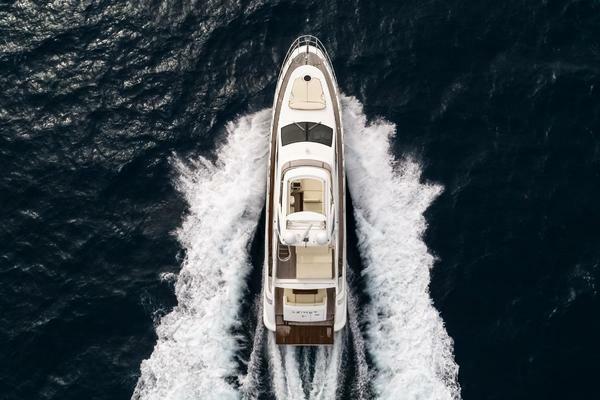 This sleek design is widely acclaimed as a high-performance yacht akin to a six-star luxury resort and her design flexibility is further evidence of Riviera’s commitment to catering to an extremely wide range of boating pursuits. Supremely comfortable, the 6000 Sport Yacht features an innovative alfresco lifestyle design, ultramodern technology and palatial appointments. Her level of attention to detail from bow to stern confirms that she is indeed a world-class Riviera. Of course the awe-inspiring aesthetic appeal of the 6000 Sport Yacht, with her sleek lines and contemporary hull windows and portholes, is just the beginning. Our talented team of designers, engineers and master craftsmen have really captured an enriched sense of light, space and liveability from bow to stern. Large fixed skylights and two electric sliding sunroofs are built into the curvaceous fibreglass hardtop, enhancing natural light and ventilation throughout the entirety of the 6000 Sport Yacht – from the expansive cockpit to the luxuriously furnished saloon and through to the generous-sized staterooms on the accommodation deck. Befitting a motor yacht of this calibre, all on-board appliances, entertainment and operational systems, fittings and furnishings are premium quality and are a perfect fit with the state-of-the-art technology which helps us set new benchmarks in terms of convenience, reliability and ease of operation. This, of course, helps us remain true to the Riviera ethos of sourcing the best and most reliable equipment and fittings from the world’s most-respected suppliers to help our valued owners achieve ‘the ultimate boating experience’. 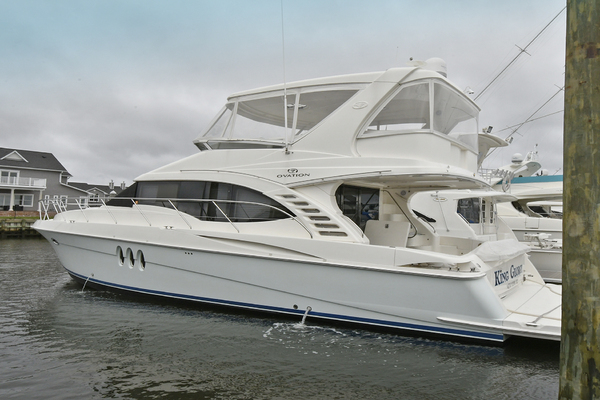 United Yacht Sales New Jersey would love to guide you through a personal showing of this 60' Riviera 6000 Sport Yacht 2017. This yacht for sale is located in Key Largo, Florida and priced at $1,890,000. For a showing please contact us by filling out the form on this page and we will get back to you shortly! Key features Sleek external styling, strong robust hull with keel Contemporary recessed hull windows and porthole designs Garage for 3.2m (10.5ft) tender and outboard 350kg (772lb) hydraulic boarding platform Wide walk-around side decks with raised bulwarks and well-placed rails for added safety Elegant foredeck with colossal-sized sun pad Generous entertainer’s cockpit measuring 10.5m2 (113ft2), with deep lounges both to port and starboard, as well as an aft wet bar, twin BBQ, drawer fridge and freezer Large awning window set in a strong stainless steel frame opens to the cockpit from the aft galley to enhance indoor/outdoor living Luxurious internal furnishings, including lounges made from the finest of padding, plush leathers and fabrics Extensive galley refrigeration with 3 fridge drawers, 2 freezer drawers and ice-maker, as well as high-end appliances Premium entertainment package – LED TVs in saloon and master stateroom, Bose stereo to saloon. Samsung home theatre system in master stateroom Opening saloon side windows aid cross-flow ventilation 2 x large electric Webasto sunroofs, one above the cockpit and the second in the saloon. Flexible four-stateroom, three-bathroom accommodation plan, with alternative layouts to suit various owner individual needs, including an expansive presidential design for the master stateroom Feature timber headboards in every stateroom, complemented by LED mood lighting Option for aft or lower-deck galley, fourth cabin, office space or lower lounge/entertainment area Option for 8m2 (86.1ft2) utility room with exceptional storage and access from both cockpit and master stateroom, or crew quarters with access from the cockpit Three C-Zone central AC/DC control panels – saloon wet bar, helm and full-beam master stateroom – with pre-set and customised modes to simplify owner operation Sports-inspired ergonomic helm with sunken dash, excellent visibility and easy access to all controls, electric adjusting leather seats Volvo Penta IPS2-950 propulsion system (2 x 533kW/725hp engines and drive units) with joystick controls x 2, Dynamic Positioning System, anti-corrosion protection, auto-pilot and optional auto-trim system Maintenance-free battery banks x4 Mastervolt battery chargers and inverter Fuel capacity 3300 litres (872 US gal), water capacity 800 litres (211 US gal) Top speed of around 31 knots under full load (fuel and water) Estimated cruising range of 401nm at 22.9 knots (with 10% reserve) Functional storage solutions throughout Thoughtfully designed-in access to key maintenance points throughout the yacht Water-tight collision bulkhead forward Riviera’s renowned hallmark built-to-last philosophy 5-year structural warranty Exclusive membership of a global family of luxury motor yacht owners Riviera has, over the past 35 years, launched almost 5200 luxury yachts that today cruise the seas, oceans, lakes and rivers of the world.